The SWAC Strategy and Policy Group (SPG) discussed priorities of the 2017-18 work programme. A draft programme has been prepared by the Secretariat on the basis of an inclusive consultation process involving all Members. The proposal is to continue and expand efforts in the area of regional governance of food and nutrition security, which has been at the heart of the Club's mandate since its inception in 1976. In particular, this work concerns the Food Crisis Prevention Network (RPCA) and the Global Alliance for Resilience (AGIR). The Secretariat also intends to promote innovative approaches to improve regional food and agricultural policies, in particular in the field of urban food insecurity and food value chains. Building on the 2015-16 work on cross-border co-operation, the Secretariat proposes to focus the 2017-18 programme on border agglomerations. It is also envisaged to give greater attention to political dialogue to support Members' and Partners' strategies. All the proposed activities will be supported by an integrated communication strategy centred on the sharing of knowledge and best practices. Members welcomed the Secretariat's proposal. They called for more explicit specification of activities and products related to gender, climate change and job creation. They warmly welcomed Canada, which announced it will join the Club as of 2017. As a founding Member of the Club, Canada has broad experience in the Sahel and West African region. All Members and partners of the Club were represented at the meeting. Germany, Norway, Spain and the United Kingdom participated as observers along with the West African Network of Farmers' and Agricultural Producers' Organisation (ROPPA). 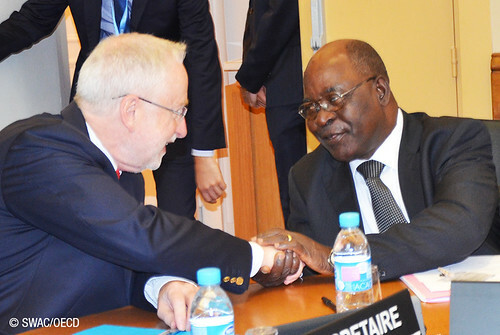 Hosted by SWAC President François-Xavier de Donnea, the meeting also benefited from the presence of Tchambakou Ayassor, ECOWAS Commissioner for Agriculture, Environment and Water Resources, Ibrahima Dieme, UEMOA Commissioner for Food Security, Agriculture, Mines and Environment, and Djimé Adoum, CILSS Executive Secretary. It was opened by the OECD Deputy Secretary-General Douglas Frantz. The work programme will be finalised by October. The next SPG meeting is scheduled for 16 December 2016 in Abuja.